When aiming for a minimalist aesthetic with maximum function in a small space, built-ins are often the best bet, especially when they take advantage of high ceilings. Lofts are a popular and highly effective way to add extra usable square footage to a structure with a small footprint without requiring extensive renovations, which is crucial when working with historic properties. 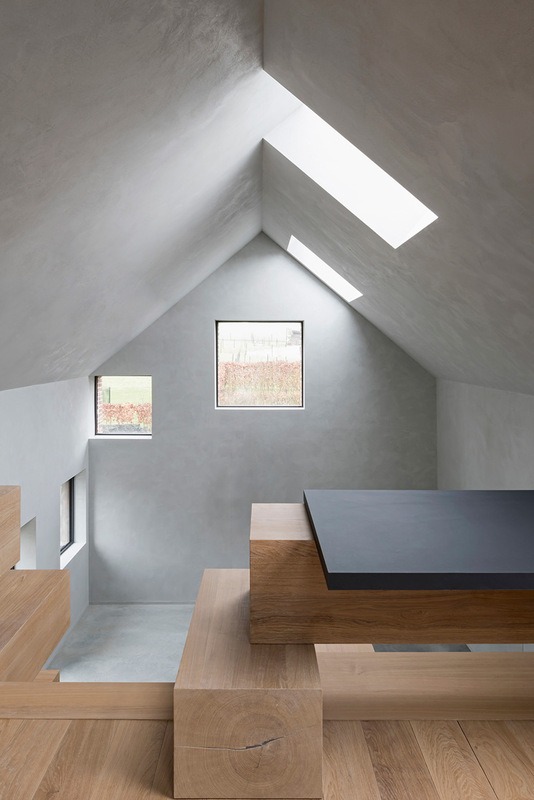 In this case, Antwerp-based design firm Studio Farris found a solution that makes use of a small barn in Flanders, Belgium, keeping the outside of the structure intact while visually expanding the interior. 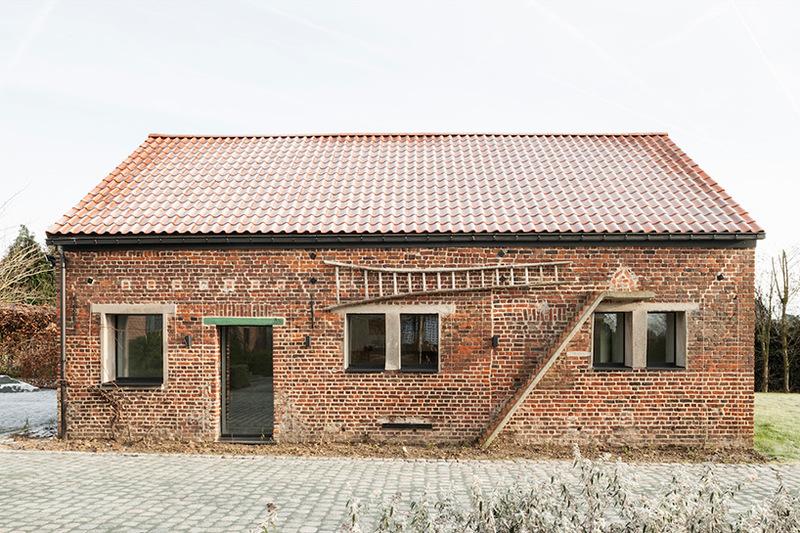 The studio restored the building’s original brick facade, giving it a new roof in keeping with its original design and replacing all of the windows with new, larger expanses of glass to bring daylight inside. From the outside, it still looks like an ordinary stable of the sort you can find all over the Belgian countryside, but you’d never guess what the inside looks like before stepping through the door. 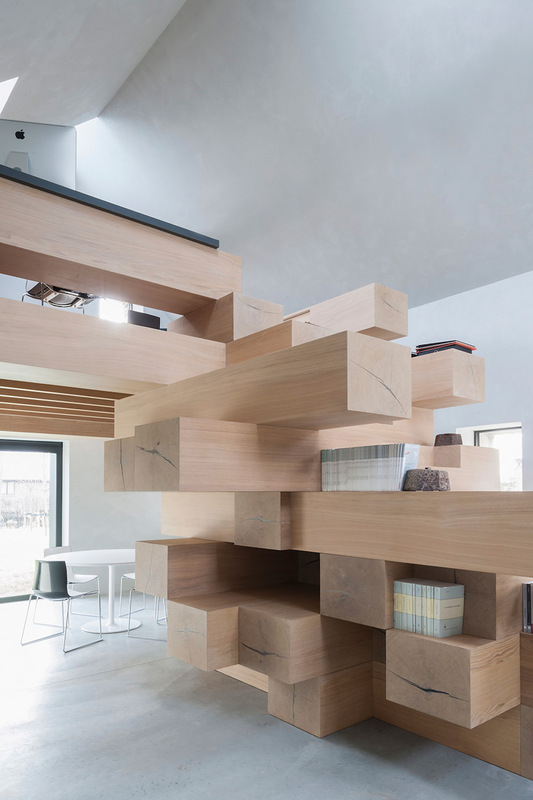 Rather than dividing the available space once again by adding a second floor, which would have made the interior feel dark and small, the designers custom-designed an unusual modern centerpiece that functions as both the support for a small loft, a staircase, and an oversized piece of storage furniture. This autonomous addition has a minimal impact on the integrity of the original structure, but makes a maximum visual impact, giving it a sense of dynamic energy. The building itself acts as a shell for this freestanding volume, needing no other walls or internal supports that would break up the space. 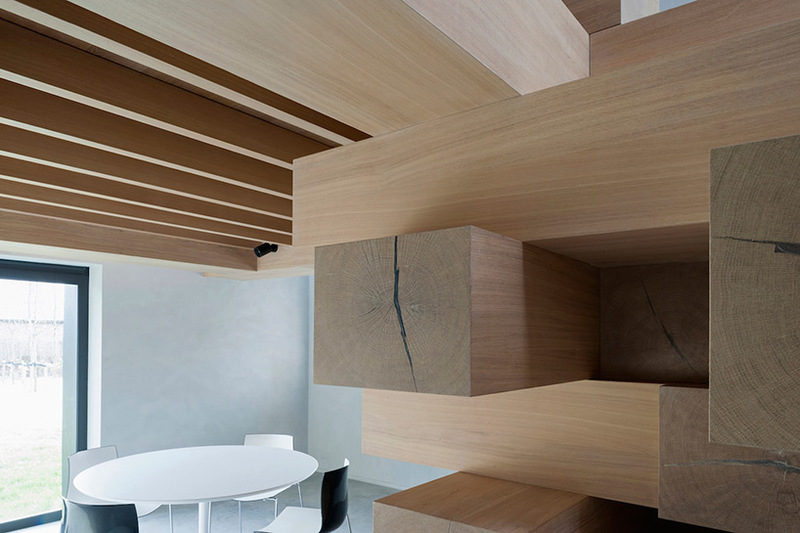 The addition is made of stacked wooden beams with a sturdy, grounded feel, but the arrangement also implies movement, as if the beams could slide in and out independently in an oversized game of Jenga. 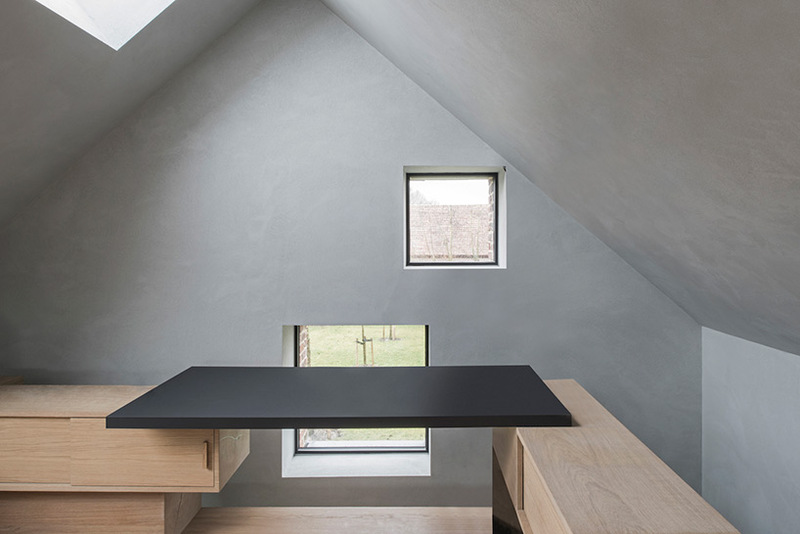 The object creates a series of new interior spaces, including a meeting area beneath the platform and an elevated office with desks positioned opposite windows framing views of the rural landscape. 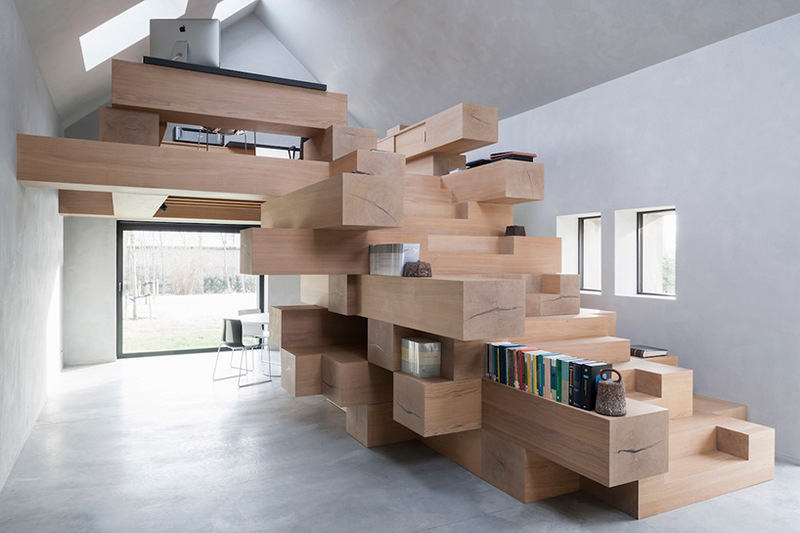 This built-in furniture system is perfect for stacking books, creating a mini library for the use of those who work within. 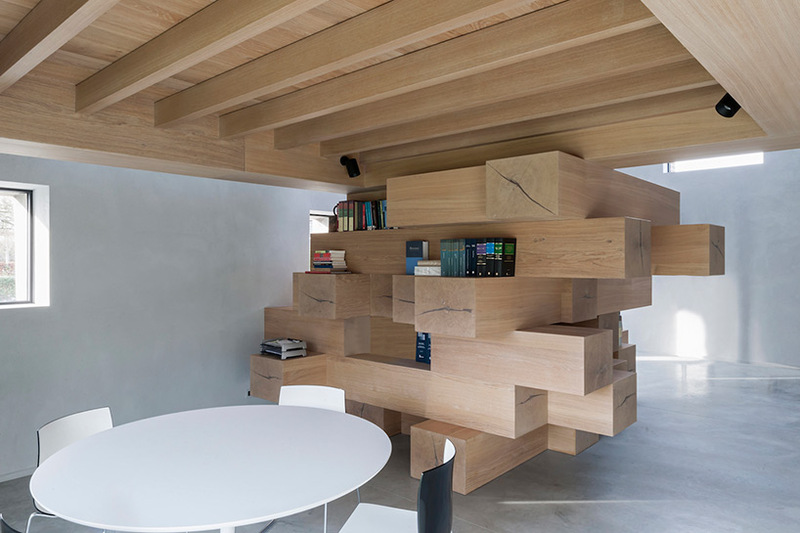 Though this renovation was created specifically for use as an office, it’s easy to imagine this same system customized for residential use as well, holding displays of personal items in addition to books. When the structure’s current life as a workplace comes to an end, the addition can be disassembled, with the beams recycled or reused for a new project.